When it comes to quality and value for your kitchen furnishings, ASA Cabinets sees no better recommendation than Schrock Cabinetry. Offering semi-custom options for home owners and contractors alike, ASA Cabinets and Schrock cabinetry have been partners for almost 20 years now and for good reason- when you make a product as exceptional as Schrock Cabinets, they practically sell themselves and they last for quite some time. With superior building techniques including dovetail jointing and half inch paneling throughout their collection, Schrock cabinets stand by a guarantee of quality. 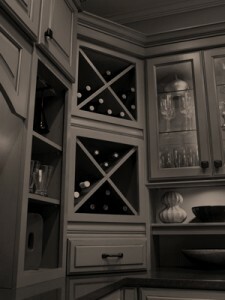 With more and more options coming every year, Schrock cabinetry really are as customizable as one would hope for. You can really make your dream kitchen your own, even with our premade options. Everything from pop-up power-centers to open-faced display cases, anything you want can be realized with Schrock Cabinetry. With their new quarter sawn oak options, Schrock has new offerings in the realm of their finishes and overall look, when compared to a traditional sliced oak cabinet. Following the natural ring patterns of the wood even better than before, quarter sawn oak gives you better grain work, and better highlighting of the woods natural formations, knots, etc.